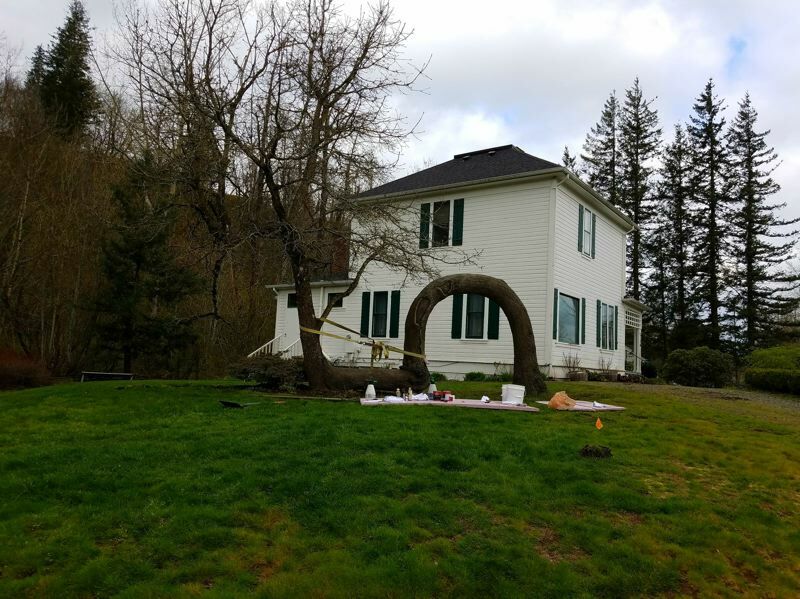 During the past couple weeks, visitors at the Troutdale Historical Society (THS) have pointed out a tree they don't remember seeing. "That's because it wasn't there." THS Executive Director LeAnn Stephan says of the Lovers Oak replica that was installed the last week of March in the Harlow House Park. "It looks so real — like it's been there forever." 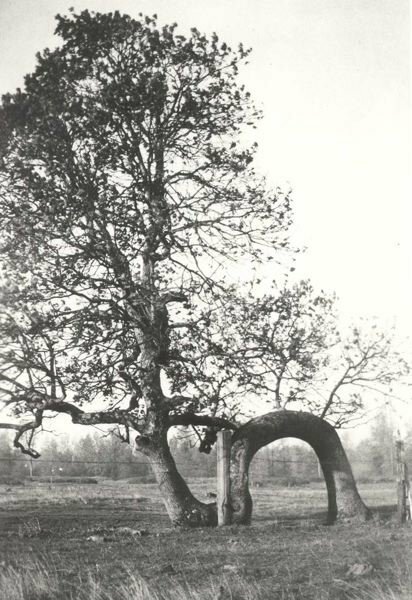 The original Lovers Oak dates back to a June 1876 flood. When flood waters receded on the banks of the Sandy River, an oak sapling was bent over a log as another log landed on top of it. Eventually the fallen trees rotted away, leaving a living tree formation. The Lovers Oak replica was made possible by a $16,000 city of Troutdale Community Enhancement Grant that was awarded to the THS Arts Council in June 2017. Troutdale bronze sculptor Rip Caswell had the vision to create an arch that would connect to a living tree that had been planted by Bob Strebin in 2001. Crete Inc. artists Mike Vernelson and Brent Montry from Richland Center, Wis., fabricated the arch out of concrete and a connective piece out of a flexible material that won't damage the tree as it grows. "You will want to see it, feel it, and still won't believe it is not a real tree formation," Stephan says. Lovers Oak derives its name from being a rendezvous point. Friends would meet up at the tree to enjoy its shade, while lovers would steal away for a kiss or two. According to a 1988 story shared by Homer Lumsden, George Lumsden and Bertha Wells became engaged at Lovers Oak in 1911. The tree was well known enough in the 1930s that it was featured on "Ripley's Believe it or Not." "It was a historic landmark everyone knew about," Stephan says. "It was a meeting place." From when its surrounding land was sold in 1889 until Reynolds Aluminum Plant was built in the early 1940s, Lovers Oak stood alone in an empty field. A public outcry to save the tree prompted Reynolds to build a fence around the tree, but the area was off limits during World War II. Vern and Marty Rathman were among those who discovered the original tree destroyed by the 1962 Columbus Day Storm. The remains were inside a small fence when Sharon Nesbit went looking for the tree in the 1970s; however, no sign of the tree or fence could be found when the Troutdale Sewer Plant was constructed at the location in 2001. Stephan says THS wants to recreate the feel of how the tree was known as a meeting spot. The organization intends to fundraise for a plaque that shares the story of Lovers Oak. Having the replica installed this year has had special meaning to THS, as the organization chose Lovers Oak as its logo in 1985 and is celebrating its 50th anniversary. "It's really exciting because we've had this logo for so long and people don't understand why," Stephan says. "This gives us the opportunity to explain it. The tree is a symbol of resilience and adaptation. As we've been researching and planning for our 50th anniversary this year, it's incredible to reflect on how much work has gone into the organization. Just like the tree, we have overcome obstacles, and become resilient to change." 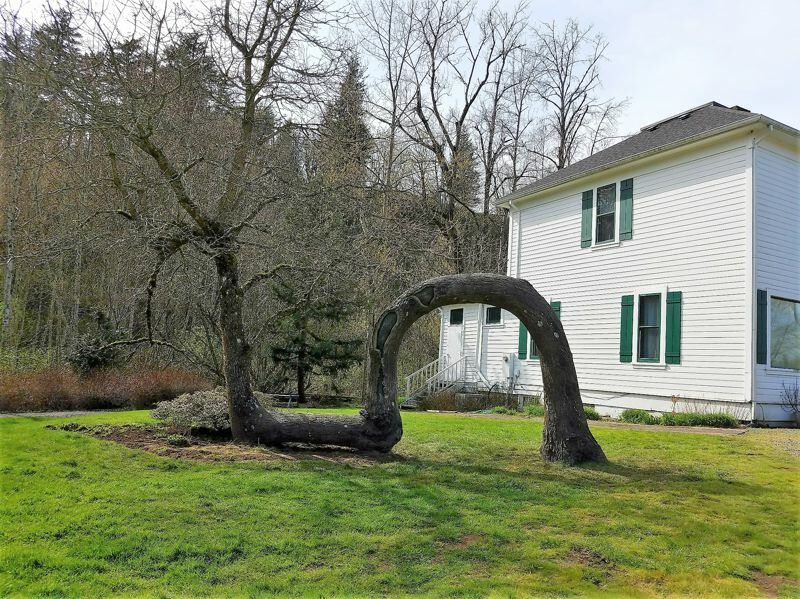 The Lovers Oak replica is located in Harlow House Park between Troutdale Historical Society's Harlow House and Barn Exhibit Hall at 726 E. Historic Columbia River Highway, Troutdale. For more information, visit troutdalehistory.org.